My former student Arjen Drost has taken marvelous pictures capturing the jump of goslings of cliff breeding barnacle geese. These three picture are taken from his website www.natureview.nl. To the right you see the gosling jumping from the cliff. 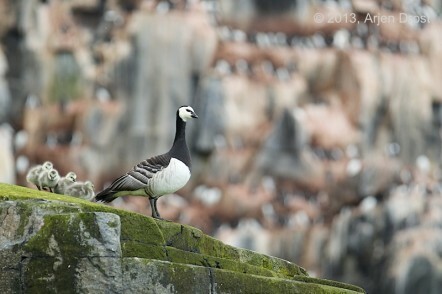 Sixty years ago, barnacle goose were known as a cliff-nesting goose species on Spitsbergen and Greenland. 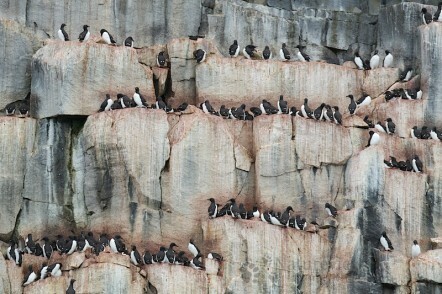 Nesting on a cliff, they were nesting away from predators. However after hatch, the goose family had to move to the feeding meadows and this was a risky operation. There was an old clip from Greenland, but this year there is new material showing the risk of the goslings jumping from the clip. Pictures from Arjen Drost and a video from Animal Planet show the dramatic jump. Since 1943, there has been a dramatic increase in goose numbers on Spitsbergen. A 150 times increase due to better food in winter and conservation measures like a hunting ban and nature reserves. To accommodate this population increase, barnacle geese started breeding on small islands. These islands were most often not visited by polar foxes and breeding was safe. Also in Kongsfjorden, the islands in the fjord were populated with barnacle geese since 1982 and the nesting numbers increased to 680 in 2013. In recent years, thanks to a study of Jouke Prop, we learned that the it was only a few decades that islands were safe for nesting as a new predator appearred on stage: the polar bear. In summer, it had disappeared from the west coast of Spitsbergen due to heavy hunting. But since 2000, it has become a regular visitor again. We are still unable to distinguish between three different causes. The hunting ban since 1968 might have supported a population increase. Or the bears might have become less shy for people and tourists. Or the bears are stuck on land because the ice is moving further away in summer. Despite all stories about climate change and scientific and public attention for the fate of polar bears,local scientists are unable to make statements about the importance of each of these three hypothesis. Nevertheless, at this moment most barnacle geese on Spitsbergen are nesting on small island and at least these birds escape the danger of base-jumping. 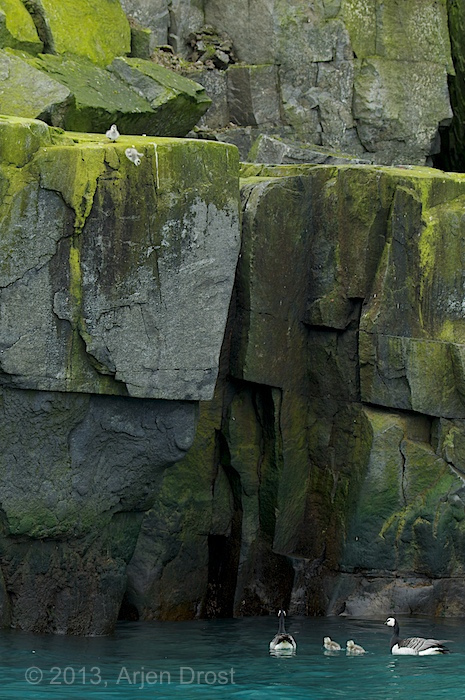 However cliff nesting is not always safe against polar bears as shown here. This video might need your permission to run ActiveX. To start the video click on the picture. And in the BBC series LIFE the jump is even more spectacular. Do start the video below. This page has been given the following keywords: [barnacle goose] [history] [video] You can click on each keyword to get an overview about related pages.